IMPACT Culinary team did it again!!! They won over a number of competitors in “Thailand Retail, Food &Hospitality Services known as TRAFS 2013 which took place in August 2013.” The exhibition mainly focused on Food, Beverages, and Retailed business. The team has been awarded two trophy cups, two gold medals, two silver medals, and two bronze medals out of the four competitions, and they were recognized as the top scoring team. IMPACT launches the first REIT (Real Estate Investment Trust) in Thailand with the total amount of Baht 20 billion by appointing KASIKORNBANK and Maybank Kim Eng Securities as an advisor and distributor. REIT will be offered to investors in the 4th quarter of this year. The money will be used to support the further development of IMPACT Exhibition and Convention Centre. Once again IMPACT has shown its leadership position in convention, exhibition and event management by being chosen by Thailand Post to manage the recently restored Grand Postal Building, an iconic historical landmark on Charoen Krung Road in Bangrak district. China Foreign Trade Centre organizes The 3rd China-ASEAN (Thailand) Commodity Fair (CACF 2013) in Thailand, to affirm Chinese businessmen’s investment direction that considers Thailand as the base of their exports to ASEAN markets for the upcoming ASEAN Economic Community establishment in 2015 and to attract potential investors from Thailand and ASEAN to the Chinese market. IMPACT Exhibition Management Co., Ltd., together with the Thai Contractors Association under His Majesty the King’s Patronage and CMC Exhibition Services Co., Ltd., jointly organize Construction & Building Technology Week that comprises 4 mega shows to serve growing demand of construction industry. The shows spread over 32,000 sqm. and featured new technology and machinery from more than 1,000 brands and companies from around the world. 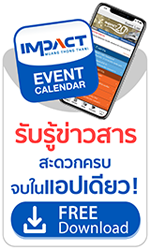 Construction & Building Technology Week will take place concurrently during 19-21 September 2013 at Hall 5-8 IMPACT Exhibition and Convention Center, Bangkok, Thailand. (June 2013) IMPACT invested 30 million Baht to build a new 3,150 square meters storage facility to house tables, chairs and other meeting equipment. The total revenue at the end of March is 2.8 Billion Baht or 40% of growth. More plans on other investments in 2013 expect to reach an income of 3 Billion Baht. (May 2013) IMPACT launches a special wedding promotion with full services and the perfect venue that can accommodate up to 3,500 people. More than 150 Indian couples have chosen Thailand to their host their nuptials, reflecting a growing market and opportunity with long ceremonies lasting 4-7 days and 4-10 million baht being spent.